Last updated on: 18 January 2018. ↑ "Association of Tennis Professionals – Singles Rankings". ATP. മൂലതാളിൽ നിന്നും 14 April 2011-ന് ആർക്കൈവ് ചെയ്തത്. ശേഖരിച്ചത്: 15 September 2016. ↑ Dirs, Ben (29 June 2009). "Murray v Wawrinka as it happened". BBC News. ശേഖരിച്ചത്: 24 May 2010. ↑ "In grand-slam finals, Stan Wawrinka has been unstoppable" – via The Economist. 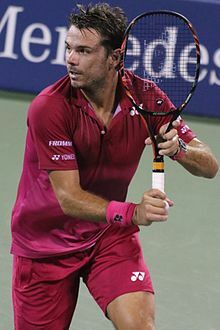 ↑ "French Open to be first tournament for "Stan" Wawrinka". tennis.com. 25 May 2014. ശേഖരിച്ചത്: 21 June 2015.